Capital Foods has not only crossed geographical boundaries but also created culinary bridges across the world with its tempting array of food products. We have a strong presence in the export market through our various food brands. Today consumers across the world have easy access to Ching’s Desi Chinese products and ingredients. Indians who have settled abroad can taste their beloved soul food, Desi Chinese, wherever they may be. Capital Foods also offers Indian food products with its ethnic brand, Raji. Through its whole spices and masalas, Raji helps ex-pat Indians to celebrate their regional cuisines and culture all over the world. 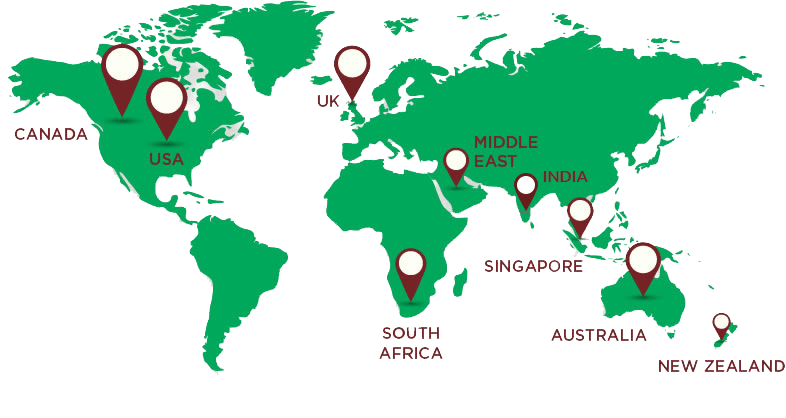 Capital Foods has a global footprint across USA, UK, Canada, the Middle East (Dubai, Oman, Qatar, Bahrain, Saudi, Kuwait), Singapore, Australia, New Zealand and South Africa (Congo and Angola).